When the garden’s summer revels have ended now and the fireworks of late-flowering plants are fading to a glimmer, there are, fortunately, many plants that we can use to lighten the passage into winter. Cercidiphyllum japonicum is a deciduous tree whose foliage emerges in very early spring. 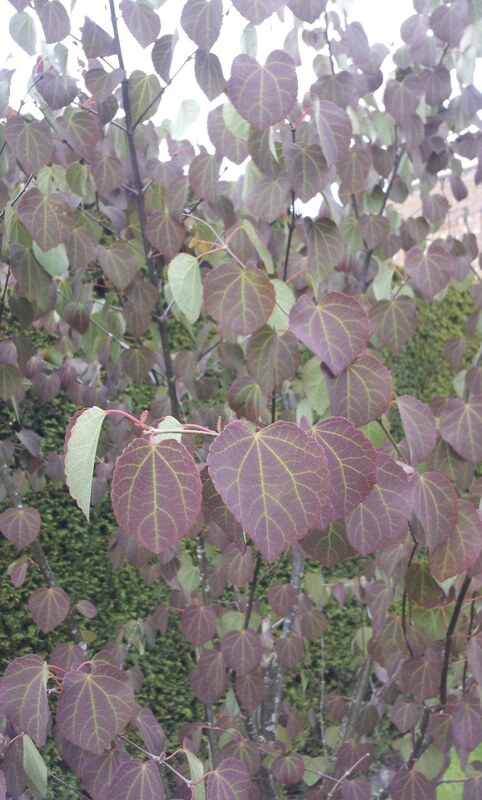 Initially a glossy dark red colour, the heart-shaped leaves mature to a coppery green and, through the spring and summer, are an excellent foil to more exuberant plants. In the wild in its native China and Japan it can grow up to 100 feet tall but in gardens it rarely makes even half that height. In Britain the new growth is invariably checked by frost, which helps to keep the plant to a manageable size. It can be grown as a single-stemmed tree but is much more effective when grown as a multi-stemmed form. There is a variety, C. japonicum ‘Rot’ (sometimes sold as ‘Red Fox’), that has dark ruddy matt brown leaves and is much more columnar that the species. Cercidiphyllum japonicum will not tolerate drought and to grow it well you need a rich, moist soil and a shady position sheltered from drying winds. At the start of autumn as the cold dark nights creep up on us, the leaves of Cercidiphyllum turn gold and apricot until the whole tree becomes a collection of shimmering amber hearts. We expect the autumn colours of many trees and shrubs to dazzle us but Cercidiphyllum japonicum has something else to contribute to the sensual pleasures of autumn – the scent of its dying leaves. To some people it’s the aroma of cinnamon or burnt sugar; to me it’s the smell of candy-floss. The perfume is not subtle or delicate, lingering modestly in the background; it is strong and heady and will fill the garden. People never fail to be intrigued and amused by such a surprising and unusual smell and that’s the real joy of this plant: before we slip into winter, its fairground perfume provides one last nostalgic reminder of the fun we have had in the garden earlier in the year.